Commercial roofing systems are far different from regular residential roofs. 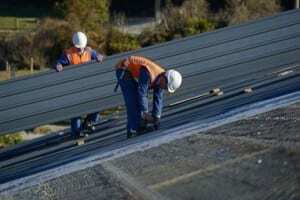 While contractors might install similar roofs or low slope roofing systems on some commercial buildings, most will have flat roofing systems, such as EPDM and TPO roofing. TPO is one of the most prevalent and popular types of roofs available on the market. It’s designed to be highly durable and weather resistant, and it has a design that makes it extremely efficient and easy to install. What sets TPO apart from other types of commercial roofing systems is its remarkable weather resistance and durability. When you install a TPO roof, you basically get a compound made from rubber and polyester fabric, which is extremely strong. Whether facing intense weather conditions or the thermal expansion associated with the summer months, this flexible and resilient roof will withstand just about anything. TPO is also great during the summer because it is able to reflect UV rays from the sun in an efficient way. This can help reduce the amount of power you need to cool your building, and it places the roof in the “cool roof” category. Finally, a TPO roof is designed to be easy to install and highly versatile. You can get it in multiple colors, including white, brown, gray and various reflective colors. Also, because TPO is much lighter than other roofing materials, your specialty trained Colorado Springs roofing companies will require less time, effort and manpower to set it up properly.